-Want to Become a Referee? Most games will be assigned at least a week in advance. Please try to respond as soon as possible. There may be some cases where due to late cancellations or field changes we may need to assign games as close as a day or two before the actual game. All games will be assigned through the http://chicagoedgesc.com website. Once you have accepted an assignment, you must call or email Thomas Schaller (708.915.9344) with an explanation so we can find a replacement as quickly as possible. You may find a mentor attending one of your games from the sidelines. They will be there for your support, not just search for mistakes you make. After the game, the mentor will likely meet with you briefly to go over any questions you might have, as well as point out some things you did well and some things you might want to work on your next time out. Go to http://chicagoedgesc.com and click on the top right Sign In button and enter your email and password. This is the only reliable way to log in to get to your account. Once logged in, if necessary, click the Admin button on the top right. This will bring you to your account. Click on any family member to update their contact info or change anything. Note that minors are not allowed to access the account settings, so their login will not go through. A parent will need to make any changes for them. To check your schedule, go to the Officials Area and log in with your email and password. You will see your general availability chart - update if necessary. Click on My Schedule to see your assigned games. For field directions, click on the Field in red. Click on the Plus icon to the left of games and you will get to a sheet with game details, including field directions, team manager and coach contact info as well as phone numbers for the other refs for that game. It might be a good idea to print that sheet and bring it to the game, so you or the team manager can contact missing refs. On your schedule page you can print out your game schedule and also export them either as a csv file or as an iCal file that can be imported into your online calendar, like Google Calendar. Since our ref assignor will assign games only as the season progresses, you will have to come back and re-export any new assigned games. The website developers are working on implementing a calendar link that would automatically show the new games in your calendar program. Stay tuned. Our online system will send you an automated game reminder email 24 hours prior to game time. If you have signed up to receive text messages (in your account settings), you will also get a text at that time. These reminders cannot be turned off. The automatic game reminder emails have a link to the game details, which include the contact info for the home team manager as well the other refs of your game – very useful, if you run late and need to let someone know. The referee game schedule is created by the various Chicago Edge team managers adding their games onto their team webpages. Our ref assignor uses those created games for the assignments. The team managers have been informed over and over that they have to keep their game schedule up-to-date. Keeping our fingers crossed! When anything aspect of the game changes (field location, time, cancellation, etc.) the team managers will make that change online and you will receive an automated alert with the changes. That will be via email and (if you have signed up for that free feature in your account settings) text message. Arrive at the field dressed. Proper black shoes, socks and shorts, as well as a yellow and black jersey should be in your possession. You should also have a whistle, stopwatch, pen, coin, yellow/red cards, and flags. Try to always be prepared to jump in at AR or CR if needed. Look professional and act professional. No later than 20 minutes before the game time. Use that time to inspect the field, introduce yourself to the coaches and team managers, and check in players. U8-U10 will have 1 center referee. 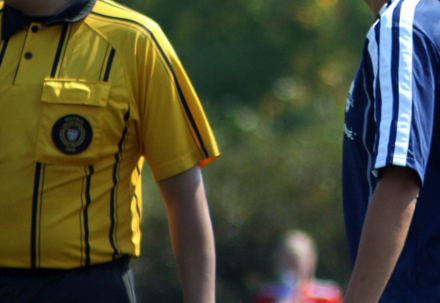 U11-U18 will have 1 center referee and 2 assistant referees. You may ultimately halt the game until such behavior ceases, addressing the issue first with the coach of the particular team as a warning. Please also make a report of such behavior to Kit Kadlec so it may be passed on to league officials. As an incentive to attract quality center referees, in addition each team manager will give the center a $10 bonus for older age groups games (U11-U18). The center referee will report the official game score to the league. The Chicago Edge has a feedback form on their website, where team managers and coaches can give feedback about our referees. They are encouraged to provide both positive feedback as well as constructive criticism. In addition, the referee assignor will make rounds on the weekends to evaluate referees in action. Team managers have also been asked to use the feedback form to let us know, if a referee did not come. WANT TO BECOME A REFEREE? Contact to find out about available certification clinics in your area.